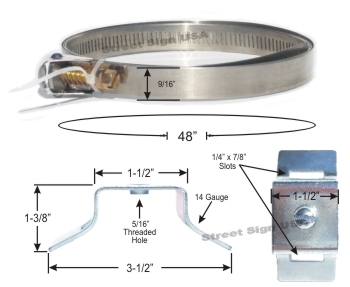 The Adjustable Band Bracket Assemby Kit is the easiest method for mounting a sign to a round pole! Kit includes everything you need to mount 1 sign. Sold in pairs, adjustable band brackets fit round posts or poles from 4" - 12" in diameter. Use on telephone poles, fences, light posts & more! After securely fastening to pole with either a screwdriver or cordless drill gun and a 1/4" socket, you can simply trim back the straps by using a pair of snips.